The side assist function assists the driver when changing lanes. The side assist function employs radar sensors ⇒ fig. 163 to assist the driver in monitoring following traffic and the blind spots on both sides of the cargggggg 151, fig. 166. 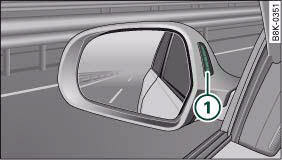 Warning lamps are incorporated in the two exterior mirrors ⇒ fig. 164. The warning lamp on the left-hand mirror assists the driver when changing lane towards the left and the warning lamp on the right-hand mirror assists the driver when changing lane towards the right. When one of these lamps lights up, this is to inform you that the side assist has detected a vehicle on that side and calculates that a lane change would be critical. This is the first stage of the warning, referred to as the information modegggggg 151. This stage of the warning is designed to be visible only when you look in the exterior mirror. If you operate the turn signal when the side assist has registered what it judges to be a critical vehicle, the lamp on the exterior mirror will then flash several times with greater intensity. This is the warning mode. – Press the button, fig. 165. The red indicator lamp in the button will light up. – Press the button again. The indicator lamp in the button will go out. The system is designed to provide assistance on motorways and other out-of-town roads, so it only operates at speeds above about 60 km/h. • Please note that the sensors are not always able to detect all vehicles which may represent a potential hazard (accident risk). • Please note that the side assist is not able to give adequate warning of vehicles approaching very fast from behind, or vehicles that you are overtaking rapidly. • The radar sensor's "field of vision" can be impaired by rain, snow or a lot of water on the road. This results in vehicles not being reliably recognised or, in some circumstances, not being detected at all by the side assist. Always give your full attention to the position of your vehicle on the road and other nearby traffic. • The side assist only gives a warning of approaching vehicles and vehicles in the blind spots when road speed is above 60 km/h. 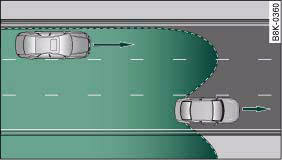 • Please note that the side assist does not operate in tight bends (with a radius of less than 200 metres). • The side assist feature is not a substitute for the full concentration of the driver. 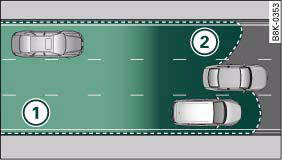 The driver is always responsible for the safety of lane changes and other manoeuvres. Always give your full attention to the position of your vehicle on the road and other nearby traffic. • To avoid impairing the function of the side assist, do not attach any objects (e.g. stickers or bicycle carriers) in such a way that they might interfere with the radar sensors in the rear bumper. • Make sure that the warning lamps on the exterior mirrors are not obscured by stickers or other objects. • To ensure that the side assist function works properly, do not allow snow and ice to accumulate on the rear bumper near the radar sensors. Please observe the additional notes on. • The side assist function will be switched off automatically when the electrical connector for the trailer socket is plugged in on vehicles with a factory-fitted towing bracket. • The side assist should be switched off manually when towing a trailer if the vehicle is equipped with a towing bracket which was not factory-fitted. • The side assist system will switch off automatically if it detects an obstruction that impairs the function of the radar sensors. • The warning lamps on the exterior mirrors may not be properly visible if tinted foil is affixed to the side windows on the driver's or passenger's side. 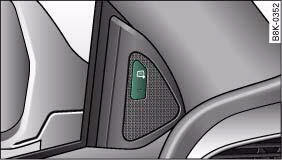 • Blind spots (dark green area) 2. The radar sensors monitor the lanes immediately to the left and right of your vehicle. Other lanes are not covered by the sensors. 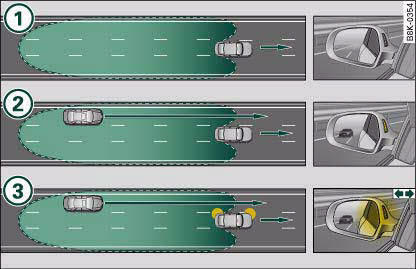 The side assist system is programmed for lanes of a fixed width, and is not able to measure differing lane widths. It monitors a zone equivalent to one normal lane width on either side. If the lanes are narrower than this, or if vehicles are not travelling in the centre of the lanes, the system may register vehicles that are not in fact travelling in an adjacent lane. When other vehicles are detected, the side assist system registers their distance and how fast they are approaching. The warning lamp on the relevant exterior mirror will light up whenever the side assist calculates that the distance and the speed differential of approaching vehicles would be critical in the event of a lane change. The warning lamp may light up when you are being overtaken and when you are overtaking another vehicle. If you are overtaking slowly, with a speed differential of less than 15 km/h, the warning lamp will light up as soon as the other vehicle enters your blind spot and is detected by the sensors. If you are overtaking with a speed differential which is greater than this the lamp will not give a warning. 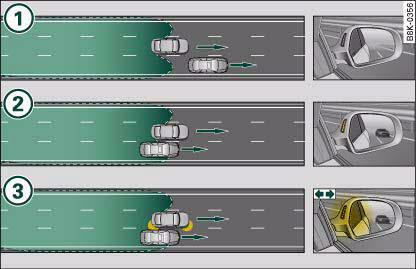 The side assist will respond in the appropriate mode, depending on whether or not you operate the turn signal to indicate an intended lane change. As long as you do not operate the turn signal, the side assist will merely inform you of the presence of vehicles that it has detected and judges to be critical in the event of a lane change. The warning lamp on the relevant exterior mirror will light up with low intensity whenever the side assist calculates that the distance and the speed differential of an approaching vehicle are critical. The intensity of the warning lamp in this information mode is deliberately kept relatively low, so that it does not distract you while you are looking at the road in front and do not intend to change to a different lane. The information mode is clearly visible when you look in the exterior mirror. If you operate the turn signal when the side assist has detected a vehicle on that side that it judges to be critical in the event of a lane change, the warning lamp on the relevant exterior mirror will flash brightly several times. This is the warning mode: if the lamp flashes brightly it warns you that you should check the situation again in the mirror and by looking back over your shoulder ⇒ in “Safety notes” on page 157. You can adjust the brightness of the warning lamps on the exterior mirrors via the MMI. The sensors have not detected any vehicles. The warning lamp on the exterior mirror does not light up ⇒ in “Safety notes” on page 157. The sensors have detected a rapidly approaching vehicle - in this example in the left-hand lane. Because of its approach speed, this vehicle is already judged to be critical in the event of a lane change even though it is still some distance away. The warning lamp on the exterior mirror lights up in the information mode ⇒ page 151. If you operate the turn signal in situation 2, the warning lamp on the exterior mirror will flash briefly several times. This calls your attention to the presence of a vehicle which you may have overlooked. 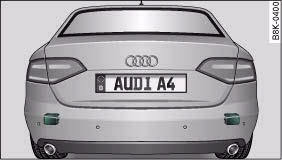 • The faster a vehicle approaches, the earlier the warning will appear on the exterior mirror. In all cases, the side assist will give a warning for the vehicles it has detected at the latest when they enter the “blind spot”. • If a vehicle is approaching at high speed it is possible that a lane change may be critical, even though no warning is given. The sensors have detected a slowly approaching vehicle - in this example in the left-hand lane. Because it is relatively far away and only approaching slowly, no warning will appear on the exterior mirror ⇒ in “Safety notes” on page 157. The slowly approaching vehicle is now closer. The warning lamp on the exterior mirror lights up in the information mode. The warning lamp on the exterior mirror will only light up if the side assist calculates that the distance and the speed differential of approaching vehicles would be critical in the event of a lane change. In all cases, the side assist will light up to indicate the vehicles it has detected at the latest when they enter the “blind spot”. • The faster a vehicle approaches, the earlier the warning will appear on the exterior mirror. The side assist will give a warning for the approaching vehicles it has detected at the latest when they enter the “blind spot”. The vehicle you are overtaking has not yet been detected by the side assist. The warning lamp on the exterior mirror does not light up ⇒ in “Safety notes” on page 157. The vehicle you are passing slowly (with a speed differential less than 15 km/h) is detected by the side assist. The warning lamp on the exterior mirror lights up in the information mode. The vehicle you are passing rapidly (with a speed differential greater than 15 km/h) is detected by the side assist but is not judged to be critical in the event of a lane change since it is dropping back quickly. The warning lamp on the exterior mirror does not light up ⇒ in “Safety notes” on page 157. If you operate the turn signal in situation 2, the warning lamp on the exterior mirror will still not give any warning ⇒ in “Safety notes” on page 157. You can adjust the brightness of the warning lamp on the sound system or MMI*. – Select: Function selector button CAR > Audi side assist > Warning lamp: brightness. The brightness of the warning lamp in both the information and warning modes is regulated automatically according to the ambient light level. 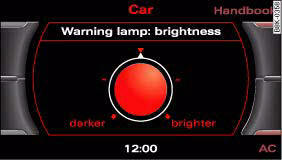 You can also adjust the basic brightness level of the warning lamp yourself via the function Warning lamp: brightness. The new brightness level will be displayed briefly while you are making the adjustment. The brightness level that is shown at this point is the intensity of the lamp when it comes on in the information mode. The intensity of the lamp in the warning mode is linked to the intensity in the information mode. The brightness of the lamp in the information mode should be set so that you can see the lamp when you glance at the exterior mirror, but are not aware of it when looking forwards through the windscreen. If you are in very dark or very light surroundings when you adjust the brightness of the warning lamp, the automatic brightness control may already have reached the lowest or the brightest setting. Under these circumstances the brightness of the warning lamp on the exterior mirror may not change visibly when you alter the basic brightness level. If you adjust the basic brightness level while the vehicle is in in very dark or very light surroundings, the change in the setting may only become visible in surroundings of more moderate brightness. • The side assist is not active while you are changing the brightness setting; the brief flash of the warning lamp is only intended to help you make the desired setting. • Your personal settings are stored automatically and assigned to the remote control key which is being used. • On roads with varying lane widths. 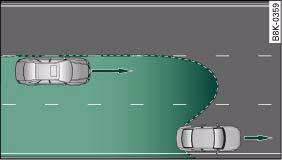 The side assist cannot detect vehicles in tight bends (with a radius of less than 200 metres). When driving through a bend, the side assist may react to a vehicle that is two lanes away and activate the warning lamp in the exterior mirror. The side assist system is designed to cover adjacent lanes of normal width on both sides of your vehicle (left and right), regardless of whether you are driving directly in the centre of your lane or further to one side. 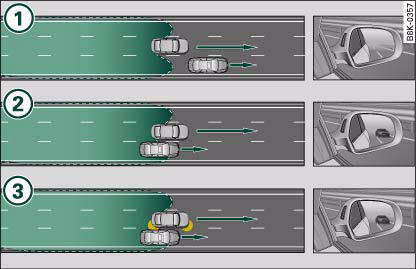 If the lane widths are reduced, the sensors may also detect vehicles in additional lanes, especially if you are driving further to one side of your lane ⇒ fig. 173. In such situations the system may react to vehicles travelling two lanes away, so that the side assist activates the information or the warning mode. Similarly, if the lanes are very wide, it is possible that the system may not detect vehicles in the adjacent lane because they are outside the area covered by the sensors.